Apprenticeship Standards (England) for Furniture and Wood Industry. Under the Apprenticeship Reforms, new Apprenticeship Standards will replace the old Apprenticeship Frameworks in England. The Furniture Manufacture Standard is now available at Level 2, which Didac is offering to all Employers and Apprentices. New Standards – what’s the difference? Each occupation will now have its own new Apprenticeship Standard linked to a specific occupational level. The new apprenticeships which are defined by these new Standards are rigorous, challenging and require the apprentice to undertake a minimum of one year’s training. 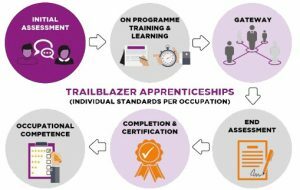 New Apprenticeship Standards are characterised by the introduction of end-point assessment replacing mandatory qualifications. On-programme training and learning needs to develop the apprentice’s knowledge, skills and behaviours – as required by the Standard. The programme is for a minimum of one year, and leads to end-point assessment. The programme must clearly set out progression milestones, which may incorporate assessment. Full requirements will be set out in the Apprenticeship Standard. Ofsted will be responsible for quality assuring on-programme delivery. The assessment organisation and the assessor must be independent of, and separate from, the training provided by the provider and employer.